With a newfound urgency, the concept of life is drawing more and more attention : ontological inquiries call upon notions of organisms, vitality, and life-processes ; critical social philosophies turn their focus on forms-of-(human)-life ; ecology-influenced approaches attempt to re-evaluate the supervenience and centrality of the human living being, while accounts of the mind dig deeper into non-reductionist understandings of biology. Since any consensual term relies on an equivocity allowing disparate concepts to proliferate without explicit dissensus, the growing interest in the spectrum of life-related concepts cannot but attract scrutiny : be it towards its explanatory claims, its descriptive reach or its socio-political background, ‘Life’ sorely requires philosophical dissection. 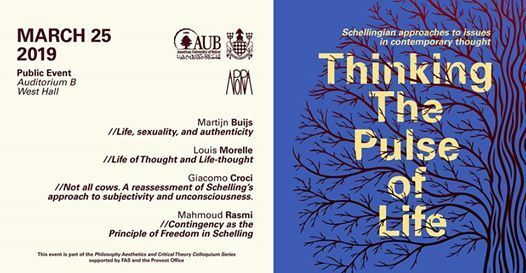 In order to bring forth an understanding from which this project might be elaborated, we here propose instead to turn ourselves to the complex yet rich philosophy of Friedrich Schelling, where the questions of nature and life are given an unique philosophical weight, and the potential unity of nature and spirit – and perhaps, their eventual and irredeemable disjunction – is articulated. A central figure in post-kantian, idealistic and romantic thought, Schelling is also one of the main references for the paradigmatic shift towards the concept of life that Western philosophy took in the 19th century, not only with respect to philosophy of nature and biology, but also regarding materialism and political and social theory. 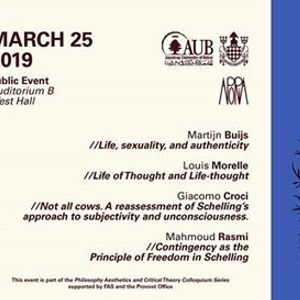 During the event we shall therefore focus on different moments of Schelling’s production and relate them to the debates and problems that currently stir the philosophical discourse. Our four speakers will give their talks and will invite you to discuss and think together about the points that they raise in an ending constructive debate.